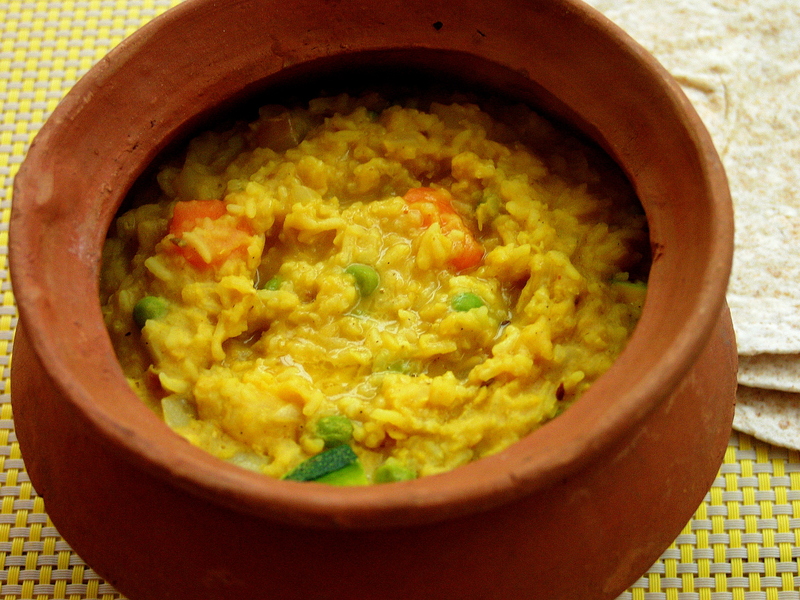 Khichuri is a traditional Ayurvedic Indian dish, consisting of rice and lentils, that is given to those who are convalescing, detoxing or fasting, it’s also really popular during puja time. 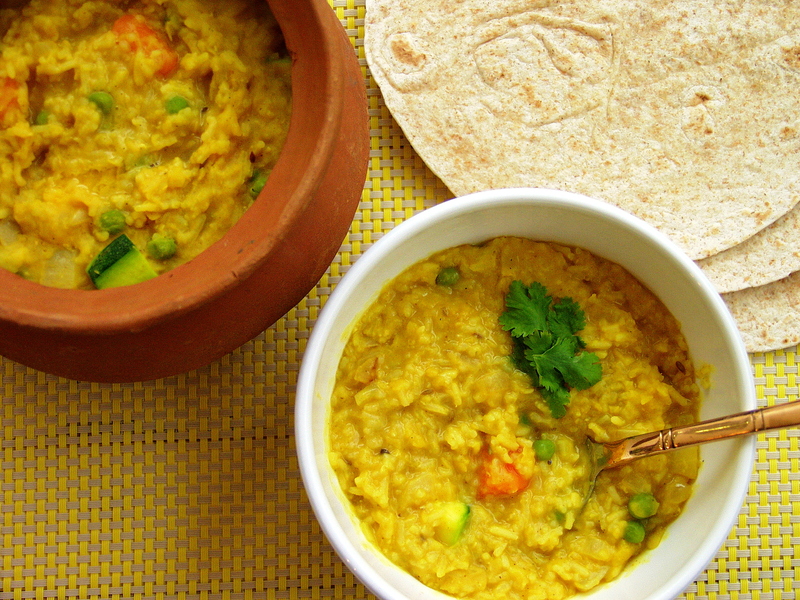 Whilst it can be eaten in its pure form of rice and lentils (no onions or garlic), most khichuri that I have eaten consists of a vegetable or two thrown in as well. It’s the perfect dish to prepare if you need to use up any vegetables before they go off. The Anglo-Indian dish of ‘kedgeree’ was inspired from khichuri and although it tastes very different the consistency is similar. My eldest daughter (Big A) has been poorly recently and this is what I prepared for her as it is both nourishing and easy to digest. There is no set rule on which lentil you need to use or vegetable for that matter. I tend to opt for red split lentils as they are the quickest to cook and need no soaking, although mung beans are also good to use (they do need soaking) as they are known for their ability to remove toxins from the body. My version includes carrot, courgette and and peas. Other vegetables would work equally well so if you have squash, marrow, cauliflower, pumpkin, green beans in the fridge (garden) pop one or two of them in and it will taste divine. I have not included chilli in this dish as I was feeding it to my daughter, however, if you need a chilli buzz yourself just pop it in (whole or chopped) during number 2 on the steps below. 1. Rinse the rice and red spilt lentils a couple of times in cold water so as to get rid of any impurities and than place in a large saucepan with 900ml of boiling water and the chopped carrots and simmer gently for 15 minutes. 2. Meanwhile place the ghee/butter/oil in a saucepan and gently fry the onion. After 5-7 minutes add the cumin seeds, ginger and garlic and mix into the onions. Following this add the turmeric, garam masala, asafoetida and stir once again. Take a spoonful of the boiled rice and lentils and mix into the saucepan ingredients and then return it back into the main rice and lentil saucepan. 3. Stir all the ingredients together and add the courgettes and peas (or any other greens you need to finish up). Simmer for a further 5-7 minutes and add salt and freshly ground pepper to taste. You may find you need to add a little more water, but just enough to make sure that the rice and lentils do not stick to the bottom of the pan. 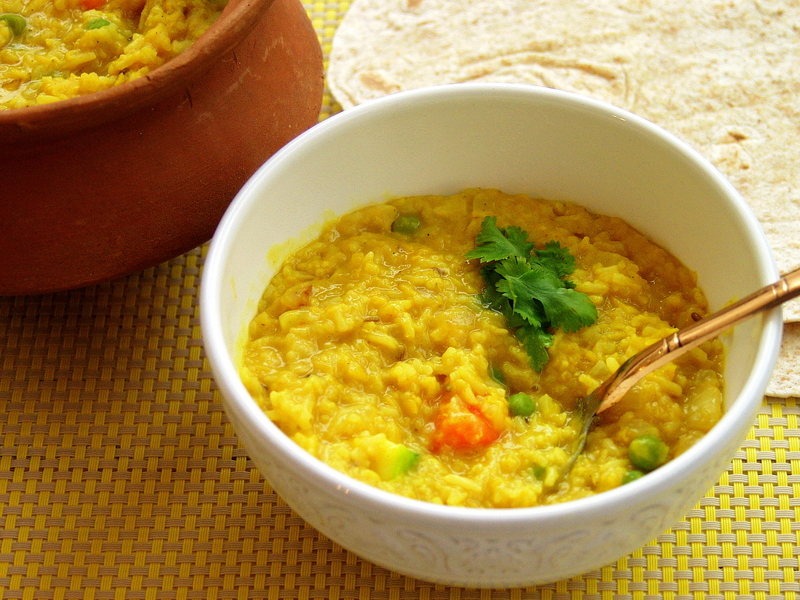 It is not meant to be the same consistency as a soupy dal. 4. Serve into bowls with a sprinkling of fresh coriander. This entry was posted in Vegetable, Vegetarian and tagged asafoetida, carrot, comfort food, convalesing, courgette, detoxing, fasting, garam masala, hing, Indian, khichuri, lentils, onion, peas, red split lentils, turmeric. Bookmark the permalink. Thank you. Yes I am a fan too. Simple, straightforward and comfortingly delicious.